How do you hold Jan-Stix? There are over a dozen variations, so whatever is comfortable for the diner. By grasping Jan-Stix in different ways you reduce the muscular fatigue that many experience when using conventional chopsticks, or even a fork. Here are some alternative methods: The Maestro: If you have large hands you can use just your fingertips, as an orchestra conductor might hold his baton. The Shortstop: Many diners hold Jan-Stix in their fingers, the way a baseball player would hold a baseball. 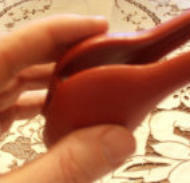 The oval handles accommodate hands of every size. The Tennis Player: Most diners use some combination of fingers and palm to grip their Jan- Stix. This is how a tennis player might hold her racquet. 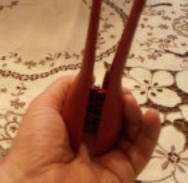 The fingers are resting completely on the handles and are diagonal to the Jan-Stix base. 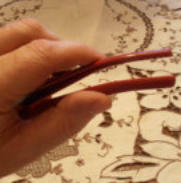 The Slugger: Holding the Jan-Stix deeper into the palm of the hand may be more comfortable for some diners. This is how a baseball player might grip his bat. Note that the fingers are now essentially parallel to the base of the Jan-Stix. The Venus Flytrap: Now here is something completely different that gives you an idea of the versatility of Jan-Stix. Grasping from the bottom (to mimic the aforementioned carnivorous plant) you can still pluck or scoop your next mouthful. 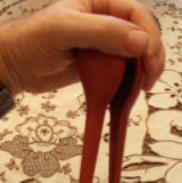 The Gemologist: My mother holds her eponymous utensil like giant tweezers to facilitate grasping each morsel. The “orange peel” texture continues up the stalks to minimize slippage, while the outer tip surfaces are smooth against lips and tongue. So give these a try, or develop a technique of your own! When scooping up rice or small vegetables the most effective technique that we have found is to squeeze the handle slightly until the tips are roughly parallel, like the tines of a fork. Then when you shovel the tips forward, keeping the tips parallel, the food will pile up between them, just as they do with a fork. 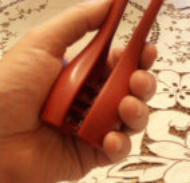 There is usually enough adhesion between the food particles to keep them from falling through the gap between the tips. 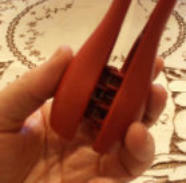 But if you squeeze the tips together they will act as a snowplow, merely moving the food to the side. What led you to develop Jan-Stix? 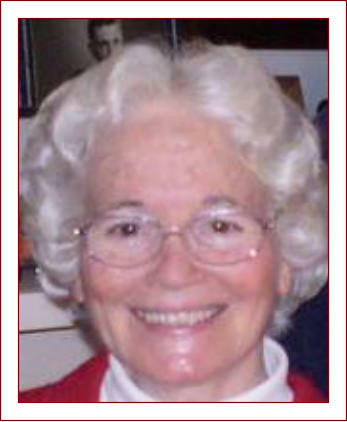 My mother, Janice Marshall, suffered a stroke in 2007 that compromised her motor functions. After my father passed, and while my mother was still ambulatory, I would take her out to lunch every Sunday. One day she was having difficulty negotiating her chicken Caesar salad with a fork and resorted to eating it with her fingers. It upset me to watch as this dignified lady was compelled to eat like a toddler. There had to be a better way! Jan had difficulty using a fork. 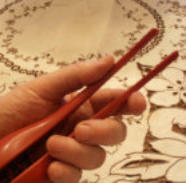 Could there be a utensil that would simulate eating with fingers, but in a safe, sanitary, and dignified manner? My first thought was chopsticks, but heck--I can't even use chopsticks! 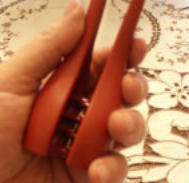 I built over two dozen models by attaching plastic chopsticks to flat, hinged plates--something like castanets. 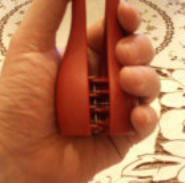 Retaining loops encircled the fingers to prevent the diner from dropping the contraption. But every configuration was uncomfortable--you basically had to slide it on, almost like putting on a glove. These models simulated the planar, two-dimensional "pinching" action of chopsticks, but one of my objections to traditional chopsticks is that they very quickly become uncomfortable to use. I began thinking in three dimensions: What if the chopsticks could envelop the food in a circular arc, the way grasping fingers close? We crafted the split handle with an oval shape to encourage the fingers to curl about it naturally and comfortably, and installed a torsion spring to make the retaining loops unnecessary. Although the product would be made from plastic I wanted to provide an inviting, “organic” tactile sensation, so we gave the handles an “orange-peel” texture that was both pleasing and reduced slipping. We wanted a textured gripping surface on the tips to help secure the food, and we found that raised nubs were easier to keep clean than recessed holes or grooves. Jan-Stix are structured to present a smooth outer surface at its tip while keeping the rugged inner surface away from the diner’s lips and tongue. Finally we angled the tip like a fork to facilitate scooping up rice and other tiny morsels. After scores of design changes and over two dozen prototypes we are now marketing a product that is comfortable, easy to use, and effective. How do I care for Jan-Stix? Our product is made from stainless steel and a dishwasher-safe, FDA-approved polycarbonate. Jan-Stix will stand up to normal eating utensil maintenance. When sanitizing with an automatic dishwasher do not place our product near the heated drying elements. Jan-Stix can tolerate brief immersion in boiling water, but should not be used for barbecuing or stir-frying. A brochure describing proper care is enclosed in each carton, or you can download the PDF here. Are Jan-Stix suitable for children? I’m sure many parents consider Jan-Stix to be the perfect solution to getting their kids eat their broccoli, but we do not recommend Jan-Stix for children under the age of eight. First of all, Jan-Stix are not designed for their small hands. And while eating with Jan-Stix may be fun, they are not toys, a fact that younger minds might not comprehend. Prudent family safety should be considered in determining when your child is mature enough to use our product. So we have no plans to offer a junior-sized version of Jan-Stix either. You will have to find another ploy to get them to eat that broccoli! Why don’t they open wider? Some have asked why the opening between the tips isn’t greater. Each year over 2,500 people choke to death in the US; seniors and children under 5 are at the greatest risk. The principle reason for this alarming statistic is that we can fit more food into our mouth than down our throat. With Jan-Stix you can pick up a one-inch meatball; anything larger is just not civilized, but also dangerous. This restricted opening can require a different technique when eating a sushi roll, for instance. So use this “poke and pinch” technique: Poke the roll with one tip to a depth of about 3/8” (9 mm). Then pinch the roll with with the other tip. You will obtain a better grasp of the roll than with traditional chopsticks, and you can bite off what you want. Just remember: “Poke, don’t choke,” with Jan-Stix! The way we prepare food depends upon the utensil that will be used to consume it. When you pierce food with a fork you break down its structure, weakening the morsel. So we need larger morsels with a more substantial structure that won’t break apart as easily. That is why salads feature large leafy lettuce, and stews have big chunks of beef and potatoes. But when preparing food to be consumed with Jan-Stix you would proportion it to be grasped rather than stabbed. The lettuce would then fit into your mouth instead of depositing salad dressing on your chin. Beef stew would then cook more quickly and evenly, and there is less likelihood that you would burn the roof of your mouth, since the smaller chunks do not retain heat as well as their larger counterparts. So Jan-Stix can help you eat more safely, elegantly, and economically! Jan-Stix are molded and assembled in Mt. Laurel, NJ. The mold was also made in New Jersey. The torsion springs are manufactured in Palmyra, NJ, and the hinge pins in Hatboro, PA. The travel sleeves are made in York, PA, and the product is warehoused and shipped from Wilkes-Barre, PA. While the raw materials are globally sourced (and may come from abroad), all crucial manufacturing and distribution is done entirely in the USA. What a great idea! Do you have a patent? The USPTO issued utility patent #8,870,254 for Jan-Stix on October 28, 2014. Click for additional product information or Get Jan-Stix to place an order.